The Russian Military Historical Society (RVIO), together with the Gorky Film Studio, is preparing the film “Zoya Passion” about Zoe Kosmodemyanskaya's exploit, the first woman awarded the title Hero of the Soviet Union during World War II. According to representatives of the RVIO, the tape will be artistic, but the creators intend to reliably portray the last hours of the life of the Soviet saboteur. The shooting process has already started on the territory of the Republic of Belarus. The Gorky Film Studio will shoot a film dedicated to the first woman awarded the title Hero of the Soviet Union during the Great Patriotic War - Zoya Kosmodemyanskoy. The beginning of the filming process was announced by the press service of the Russian Military Historical Society (RVIO). Speech in the film titled "Passion for Zoe" goes about the last days of life and the feat of Kosmodemyanskoy. It is expected that, despite the increased attention to the facts, the tape will be not documentary, but artistic. “There is no fiction in the film, if we talk about the facts. The film tells about the last day of life of Zoya Kosmodemyanskaya, reveals the feat itself. The emphasis is on tragic minutes. It seemed to us important to investigate this hard feat and explain to ourselves and the people how the young Komsomol member came to such an act and was able to remain steadfast. As Jeanne d'Arc, ”Nadezhda Usmanova, the head of the information policy department of the RVIO, told the RT interview. The idea to remove the picture, dedicated to the first woman-heroine of the Soviet Union, emerged from historians long ago. According to Usmanova, the RWIO staff, who initiated the creation of such a film, thought about the project even during the restoration of the house where Kosmodemyanskaya spent the last 24 hours of her life. Another factor for the development of the project was the bitter statistics: as the head of the department notes, a significant number of Russians no longer remember the feat of the young Komsomol member. “RWIO, its employees and many people in our country know about Zoya Kosmodemyanskaya and her heroic deed. But, unfortunately, we noticed that lately many people do not know, do not remember - even Zoe’s attacks and accusations of everything started. Once she, a young girl, came to the defense of the motherland, the world and our present. We believe that now we must protect it from attacks, falsification and denigration, ”she explained. 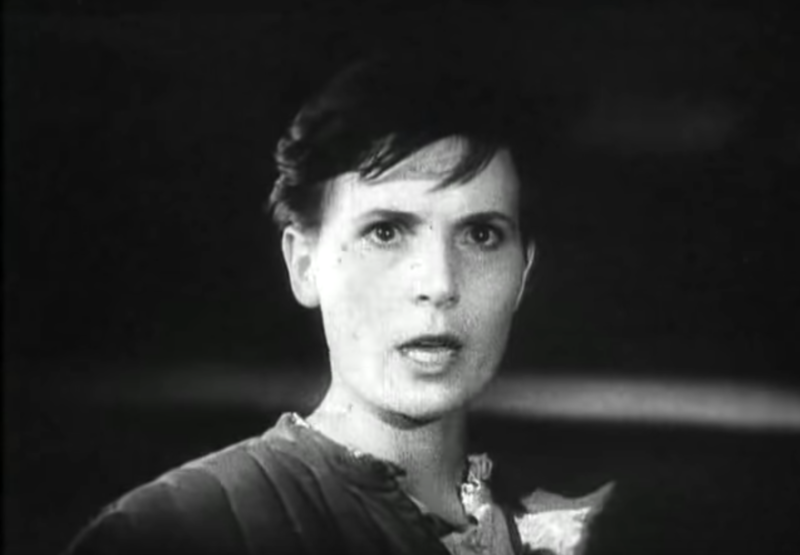 Frame from the film "Zoya"
In parallel, RWIO is taking other steps to restore and preserve the memory of the heroic deed and the name of Zoya Kosmodemyanskaya. For example, on the highway near the village of Petrishchevo, where the heroine died, corresponding signs were installed. The museum is also being restored in the native village of Kosmodemyanskoy Osino-Gai, Tambov region. The development of the script, based on the biography of Kosmodemyanskaya and eyewitness accounts of those events, was done by Andrei Nazarov and Leonid Plyaskin. The latter also acted as a film director. Irina Pegova, Daria Yurgens, Anna Ukolova, Nikita Kologrivy, Dmitry Bykovsky, and Wolfgang Cherni are shot in the tape. The main role will be performed by theater actress Anastasia Mishina. Already in February, will begin shooting the first scenes from the film. They will be held on the territory of Belarus and in the village of Zabrodye of the Vileika district - it was there that they managed to “find the pre-war village buildings”. Support for the ideological inspirers of the film and the Gorky film studio (there, by the way, the picture of Lev Arnshtam Kosmodemyanskoy was restored) was provided by the Russian Ministry of Culture. However, the RVIO is collecting donations. At the moment, managed to collect more than 16 million rubles. “This, in our opinion, is a substantial amount. Someone writes his name - we will definitely include it in the credits of the film. For people, the feat is very significant, and public support for the project is important for us. Gorky Film Studio received funding from the Ministry of Culture of Russia in the amount of 60 million rubles. We also have organizations that are ready to make a contribution, ”Usmanova added. Zoya Kosmodemyanskaya was born on September 13, 1923 in the village of Osino-Gai (now the territory of the Gavrilovsky District of the Tambov Region). Later, the Kosmodemyansky family moved to Moscow. At the age of 18, Zoya Kosmodemyanskaya went to war as a volunteer. She became a partisan fighter in the 9903 headquarters of the Western Front, where she was trained in intelligence and communications skills. While on a mission in the Moscow region, Zoya, along with other soldiers, set fire to houses in which the Nazis stored ammunition. In the village of Petrishchevo Kosmodemyanskaya one of the homeowners noticed and reported on this to the Nazis. The girl, through a translator, was interrogated by several Nazi officers. Having introduced herself by another name, Kosmodemyanskaya refused to answer the questions of the invaders, for which she was subjected to cruel torture. However, the answers from it could not be achieved. On the morning of November 29, 1941, Zoya Kosmodemyanskaya was hanged.